On Tuesday I wrote about how I was very much un-wowed by Google’s recently announced latest addition to the Nexus line of devices, the 5X. There was, however, something announced at last week’s Google event that I was very excited about. Chromecast devices have been around for a little while now, and they’re a USB-powered dongle that plugs into a spare HDMI port on your TV and allows you to “cast” video from your phone to display it on the big screen. The audio version follows a very similar concept. It’s also powered by USB, but then it plugs into your existing stereo and allows you to “cast” music to it from your phone. You could argue that Bluetooth works just fine for doing this – indeed we have a Bluetooth speaker in the kitchen for just this sort of thing. Google tells us that a WiFi device can offer better sound quality than Bluetooth is capable of and has some other benefits too, but I don’t care about any of that. What I’m excited about, is the possibility of whole home audio. I built my whole home audio system from a collection of raspberry pis because I thought the existing offerings in the marketplace didn’t offer good value. Apparently Google agree. 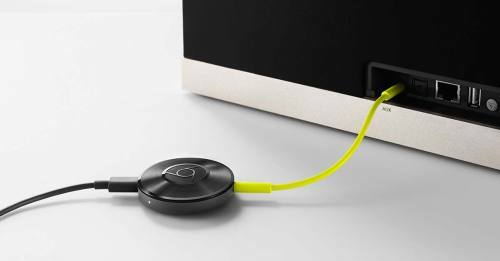 The Chromecast audio won’t have whole home audio functionality at launch, but apparently it’s coming in a future software update. I for one am very excited about this. The Chromecast does much the same thing, but for the price of one Sonos Connect you could buy ten of them.